Astrophotographer John Chumack took this image of Tycho Crater on the moon's surface on February, 19, 2016. Tycho crater is often the star of many skywatcher images because it's clearly visible on our Moon's surface and can be seen in stunning detail in this image. Astrophotographer John Chumack took this image on Feb. 19 with a 6-inch Newt Reflector Telescope & ZWO 120M Monochrome camera, 500 frames stacked in Registax6. 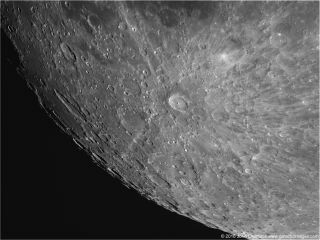 About half way between the Straight Wall and the moon's south pole is Tycho crater, named for Danish astronomer Tycho Brahe . Although not the largest crater on the moon, Tycho is one of the brightest, indicating that it is one of the youngest of the craters. It is the point of origin of a huge system of rays which encircle the moon, best seen in about a week when the moon is full. Tycho is 53 miles (86 kilometers) in diameter with classic central peak and terraced walls.